Ireland was ruled by the British until December 6th 1921. After this the country was partitioned into The Irish Free State (composed of 26 counties) and Northern Ireland (composed of 6 counties). Northern Ireland remained part of the United Kingdom, and the Irish Free State went on to become the Republic of Ireland. During British rule several of the Joint Stock Commercial Banks had acquired the right to issue banknotes under various rules and restrictions. The Bank of Ireland was the first bank to issue paper money for circulation exclusively in Ireland. Its first issue was in 1783. Other banks later also received the right to issue paper money. The right of note issue continued during the early years of the Irish Free State. The Currency Act 1927 provided for the creation of the Currency Commission Ireland to control the issue of currency in the new Irish state. In 1928 it commenced the issue of A Series Legal Tender Notes. 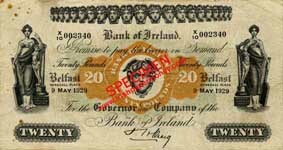 In 1929 the currency issues of the Associated Banks (commercial banks) in the island of Ireland split into Consolidated Banknotes controlled by the Currency Commission in the Irish Free State, and a new Belfast issue in Northern Ireland. The Consolidated Banknote Issue replaced the banks' own note issues in the Irish Free State. The notes issued by the six banks were never legal tender, except during World War Two when Legal Tender status was granted as an emergency measure. This status was revoked again after the war's end. There are two basic Type groups for Northern Ireland banknotes. These notes were generally larger and based on the pre-1929 designs. All of the banks began to new produce modern small sized note designs in the late 1960s and early 1970 These banknotes incorporated the latest security features of the time. Examples of many of the old banknote varieties and types are not available for illustration here. We would welcome submissions from anyone in possession of banknotes not pictured on this web site. www.irishpapermoney.com • Version 2.1.0 • COPYRIGHT ©2000, 2015 M Mac Devitt.